For the 11th time of the 2010 season, a NASCAR Nationwide Series was claimed by Toyota golden child Kyle Busch. 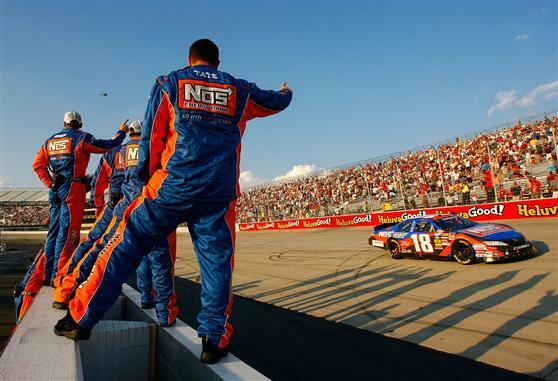 Making the series into his own personal playground whenever his NASCAR Sprint Cup series obligations would allow, Busch's win at Dover International Speedway again showed how much of an unbeatable force the #18 Joe Gibbs Racing Toyota is for these particular races. When green dropped for the Dover 200 on the concrete one-mile, Kyle Busch's teammate Joey Logano's #20 Toyota led the 43-car field. Starting 2nd, the #18 Toyota Camry swept by the 20-year old Logano for the lead on turn 4 of lap 4. Busch would be completely free of the #20 exiting turn two. Little did many know at the early stage of the 200-lap affair at Dover, the lead change between Joe Gibbs Racing served as one of only three passes for the lead in the event. Besides the attention that Kyle Busch was creating at the front, IndyCar star Danica Patrick drew eyeballs once again driving the #7 Godaddy.com Chevrolet for JR Motorsports. Though practice provided a glimmer of optimism when Patrick was 12th fastest. However, the Dover 200 continued to add to the difficult part-time rookie season for Danica Patrick qualifying 42rd out of 43 cars. Because of 150 MPH average laps and the close quarters of Dover International Speedway, the #7 Chevy was lapped quickly with crew chief Tony Eury Jr accepting admitting a good day for Patrick's first outing at the track would have her finish 3-4 laps down. Unfortunately, Patrick's day at Dover would result with bad luck when a tire failure tore apart her car's front-right fender. 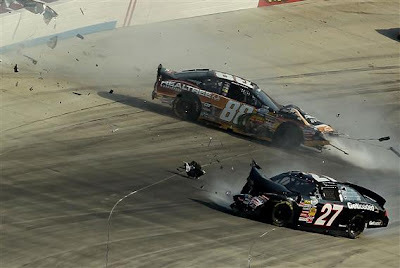 After an extended time behind the wall to repair the #7 Chevy, the JR Motorsport team succeeded in finishing the event but ended the Dover 200 92 laps behind. As Patrick's car brought out the first caution of the event, few drivers had been able to even keep pace with the #18 car. Providing the only adversary to Kyle Busch through the event was the #60 Roush-Fenway Racing Ford of Carl Edwards. While never leading a lap on the day, Edward ran second to Busch for a considerable time at Dover. However, Busch only major challenge through the Dover 200 would suffer inconvenience into the second half of the event due to a pit stop mishap. Costing Carl Edwards a chance to effectively battle Busch to the end, the #60 finished 3rd at Dover. With four cautions slowing the Dover 200, one yellow flag eventually transferred to a red flag for a major crash in turn four. On lap 136, the #88 of Elliott Sadler slid into the turn 4 wall appearing initially to be a single-car wreck. Unfortunately, as the #88 JR Motorsports Chevy coasted down the 26 degree banking, the #27 Baker Curb Racing Ford being driven by Drew Herring crashed into Sadler violently without a chance to avoid the #88 car. Both drivers were alright following the accident finishing 32nd and 33rd. Stopping the race for nearly 11 minutes, NASCAR resumed the race once the track had been cleaned of debris and fluids. A less serious turn 3 wreck involving the #22 Dodge of Brad Keselowski and the #66 Toyota of Steve Wallace served as a chance for contenders to Kyle Busch to emerge but no one could catch the #18 Toyota. Winning more than 1/3rd of the 2010 NASCAR Nationwide Series races so far this season, Kyle Busch's Dover 200 trophy was earned after leading 192 of the race's 200 laps. Along with dominating the one-mile concrete track, Busch surpassed the NASCAR Nationwide Serise record for most victories in a season. The previous record of 10 wins was earned by Sam Ard in 1983. Reversing positions from the start, Joe Gibbs Racing teammate Joey Logano finished 2nd. Edwards, Reed Sorenson and Kevin Harvick rounded out the top-5 in the final running order. Other performance of note belong to some up and coming drivers in the NASCAR Nationwide Series. Trevor Bayne finished 6th in this #99 Toyota while rookie of the year candidate Ricky Stenhouse Jr captured 11th in the Dover 200. The next race for the NASCAR Nationwide Series will take place last week at Kansas Speedway on Saturday afternoon.